Congratulations for new pet dog: Know someone who brought home a new puppy? Celebrate the new addition to their family by writing a sweet message on a greeting card. This post is an uber cute mix of heart-warming quotes that signify the deep bond humans share with their four-legged friends. Take ideas to send texts, tweets and posts to the Facebook timeline of your friend who is basking in the love of an adorable pup. 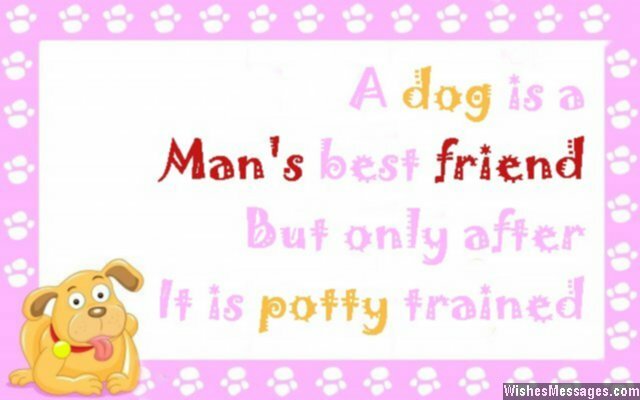 1) A dog is a man’s best friend but only after it is potty trained. 2) Just like how butter melts on a hot pan, your heart will melt when your cute puppy takes a nap in your lap. Congratulations. 3) Your DOG will always treat you like its name spelt backwards. 4) Happiness is something that wags its tail and can say Woof. Congratulations for bring home happiness. 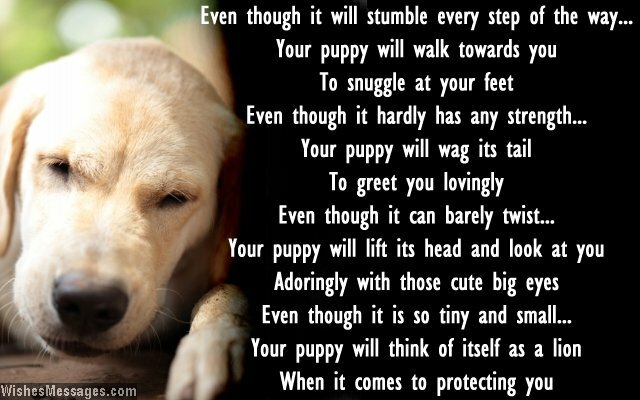 5) Even though it will stumble every step of the way, your new puppy will walk towards you to snuggle at your feet. Even though it hardly has any strength, your puppy will wag its tail to greet you. Even though it can barely twist, your puppy will lift its head and look at you adoringly with those cute big eyes. Even though it is so tiny and small, your puppy will think of itself as a lion when it comes to protecting you. Congratulations, for getting home a true friend. 6) The man’s best friend that you brought home better not take the place of your real best friend. Congratulations. 7) Don’t worry about the dirty paw prints on the sofa, your dog’s undying love for you will be the biggest imprint it will leave on your heart. 8) A new puppy hasn’t just entered your home, it will soon enter your heart and stay there permanently. Congratulations. 9) Your sweet pup’s videos are bound to go viral on YouTube. Congratulations for bringing home an internet celebrity. 10) As you nurture your new puppy into a dog, you will forever become his Superman. 11) You will microchip your dog with a device. But your dog will microchip you with its unconditional love and affection. Congratulations. 12) Your dog will never speak, but it will always listen. Your dog will never hate, but it will always love. Your dog will never let you be sad, it will always make you happy. 13) If you treat your new puppy no less than a family member, it will treat you no less than a god. 14) Whenever you feel sad, whenever you feel low, whenever you feel frustrated, whenever you feel unhappy – the innocent look in your puppy’s eyes will all you will need to feel better. 15) Do you know the meaning of true friendship? Your new puppy will teach you as it grows older. 16) You have not just brought home a cute puppy. You have brought home a cute little bundle of happiness. Congratulations. 17) You have committed one of the greatest acts of charity by bringing a puppy home from the animal shelter. Congratulations. 18) Thanks for giving me one more reason to visit you everyday – you have brought home the cutest thing ever. Congratulations. 19) A wet nose and a wagging tail is about to drive all your troubles away. Congratulations. 20) You family is perfect. But with a new pet dog, it has become picture perfect. Congratulations. 21) Think you are going to be a master of your pet? Think again – you will have to clean its poop, feed it, take it out for a walk, bathe it and do many other things to keep it happy. Congratulations for becoming a slave. 22) Congratulations for getting home a dog. Now you will realize the meaning of unconditional love. 23) You will now understand the real meaning of forgiveness when your new puppy licks you even after you scold it for pooping on the sofa. 24) It doesn’t matter what the pedigree of new pet dog is, what matters is that it is coming into a family with an amazing pedigree. Congratulations. 25) Congratulations for permanently saying goodbye to boredom and monotony. With a new dog, your life is going to be full of fun and always happy. 26) Congratulations for welcoming home a new dog. I will be waiting to see lots of cute pictures on your blog. 27) Congratulations for bringing home not just a puppy, but the greatest and cutest stress buster mankind has ever seen. 28) Your best friend is jealous of new furry friend but wishes you congratulations nevertheless. 29) Running your hand over your pup’s furry head, scratching your pup’s chin, holding your pup’s paw, tugging your pup’s ears, cuddling your pup when it sleeps in your lap – enjoy these priceless pleasures of life. Congratulations. 30) I can see that you have fallen, in love and your heart has been permanently taken. Congratulations for your adorable new pup. 31) Your pet dog is going to be your friend who will never judge you, never care about how much money you have, never have a grudge against you and always love you until his dying breath. 32) Your new puppy is a guarantee that you will never have a bad day as long as you come home to be greeted by its innocent eyes. 33) Don’t be under the false assumption that you have got home a new puppy. In reality, you have grown your family by one. Congratulations. 34) You’ve just found yourself a new full-time job which you will love – petting your cute pup. Congratulations. 35) Your new pup is so cute, that you will want to cuddle it even after it poops around the house. Congratulations.